Olexa's in Mountain Brook is one of our favorite places to eat lunch. We make it a point to try and eat there at least once a month. It is the only place we eat that every table gets dessert! Olexa's is known for their cakes, but the food in the cafe is fantastic. Chicken Leg's loves the Chicken Tomato Bacon Caesar Salad and the Portobello and Smoked Gouda Panini. My favorite is the Beef & Cheddar Chipotle Panini. 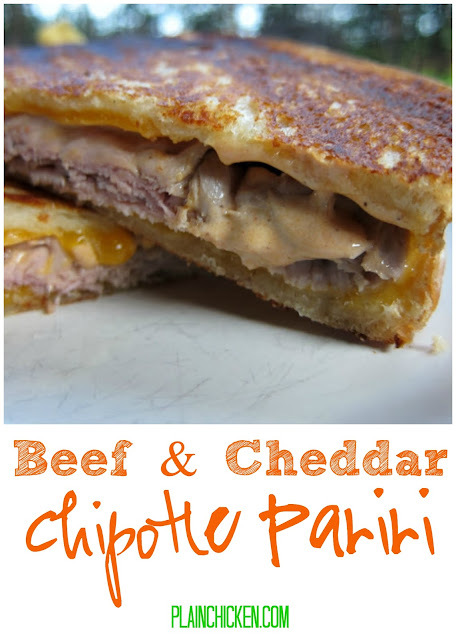 I finally decided to make an at home version of the Beef & Cheddar Chipotle Panini. (It pays to be the cook) It was fabulous!! It tasted almost exactly like the original. Now if I could only figure out how to recreate the cake!! Today is Chicken Leg's birthday! We celebrated a few days early with a cake from Olexa's, of course. He requested his favorite - chocolate cake with vanilla icing. I only got two small slices - the boy loves his cake! Mix together ranch dressing and adobo sauce. Set aside. Yum! This sandwich reminds me of Dead End BBQ's Tennessee Cheddar and Beef except theirs uses sliced brisket.